Visitors walk into a stark white labyrinth. Niches are seamlessly carved from the sweeping arch of towering forms, platforms elevated high above, and others seem to float in an endless expanse. This brightly lit edifice is the stage for Rei Kawakubo’s “The Art of The In-Between”, at The Metropolitan Museum of Art, serving to echo the movement and forms of the famed Comme Des Garçon designer. The colors of the clothing grab us first: vermillion red, dark matter black, bone white, blush pink, electric blue, moss green. The architecture contains the work, but it is the color that draws us into our exploration of the collection; they are simply delicious. One salivates over the richness of the pallet as it shines against the minimalism of the architecture. Bubblegum pink geometric confections juxtapose Elizabethan velvet blues and greens. Candy apple reds and black make every Commes De Garcon fan and vampiric visitor truly covetous. White runs the spectrum from champagne to bandage with skin tans, brown paper bag, and the rusty pink color of my mother’s compact blush. All of this displayed in a myriad of textural fabrics: decadent velvets, impossibly refined silks, roughed, frayed wool, intricate feather work, chiffon muslin, tulle, the list goes on in a brilliant patchwork of materials. The play of texture and color on white canvas sounds like abstract painting, but this is fashion. 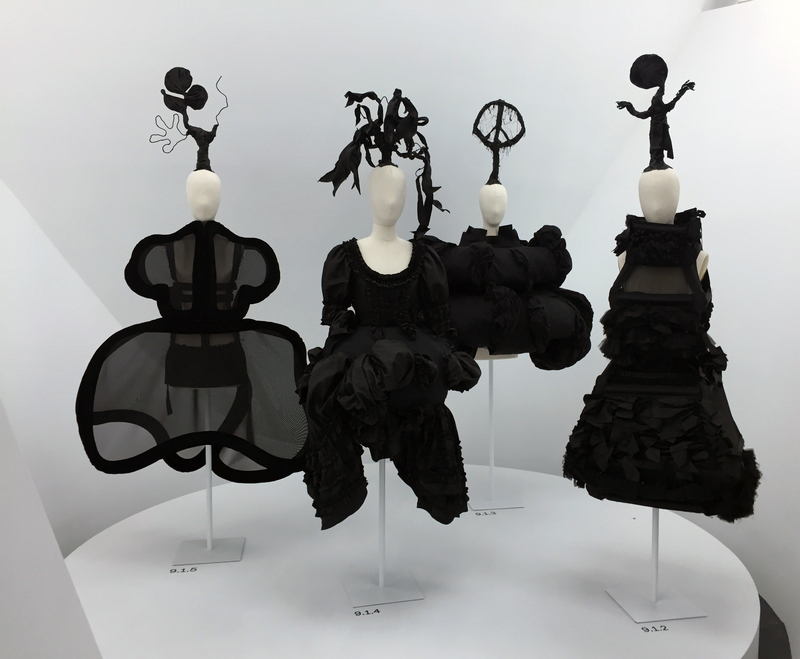 These elements wrap the body in the spectacular oddity of Kawakubo’s invention. The female form is extenuated and deformed, anatomy with no bounds. The brilliance of the work is the link between material, color and silhouette. The brilliance of the exhibition is the balance of the designs within the space. 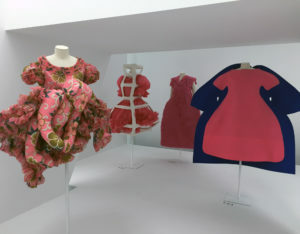 We peek into a rectangular chamber, a collection entitled, “Child/Adult”, to gaze upon a dress, “2 Dimensions”; pink and blue fabric extends well past the diameter of the body in an oversized play of joyful geometry. In another corner, a large cylindrical chamber entitled, “Life/ Loss”, a dress, “Ceremony of Separation”, has large holes in heavily padded fabric. These titles read like chapters in a book, as the designer weaves tales with each piece. A verging-on-Victorian wedding dress, “The Broken Bride”, in the “Birth/Marriage/Death” collection, drapes elegantly in a mélange of silk, lace, and cleverly wrinkled fabric printed on georgette. This is fashion trompe l’oeil at its gothic best. “Ceremony of Separation” in the same collection, is a symphony in black tumescence, black polyester, lace, net, and attached children’s dresses and bonnets surround the body in a huge, protective mourning cloak. There is a coffin-like dress, “Invisible Clothes”, in the “Abstraction/Representation” collection. The padding begins with the body and reaches far away, forming its own morbid environment that one would literally have to crawl into.“Body Meets Dress” is an orchestration in bright crimson, with protrusions that both deform and sexualize. Art tilts into body fetish and finds beauty in the grotesque. The extended silhouettes are even enviable in their particular grace, regaled while challenging the paradigms of modern beauty. Hips and busts are extended well beyond bodily recognition: bulbous shoulders and impossible rears envelope size 2 mannequins in a controlled explosion of padding. Body parts show themselves as extra appendages. 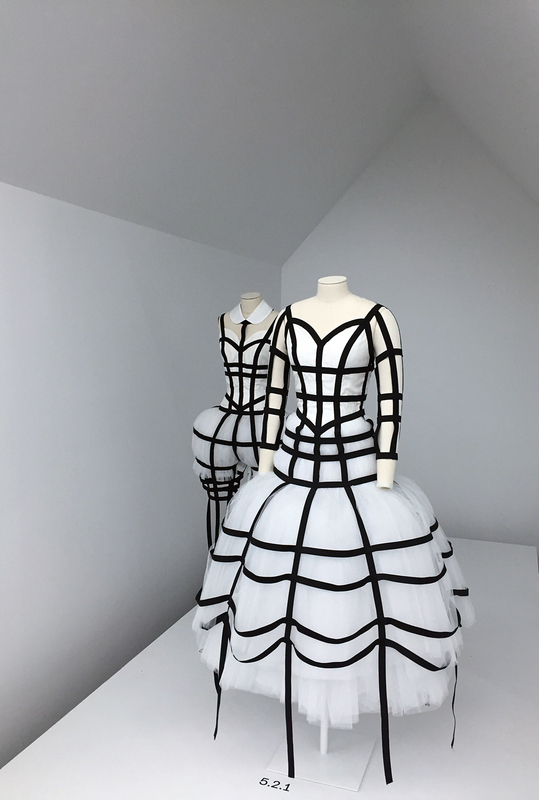 “No Theme (Multiple Personalities, Psychological Fear)” in the Abstraction/Representation collection, attaches two bodies into one dress, Siamese twins presented in a chamber read like a vignette. Another mannequin, of the same name, features her own twin attached to her back like a fabric albatross. These twin-pieces are in conversation. What is ultimately striking, is the perfect harmony of the bound pair. The space in-between each body is taken away, we see the form as one large play of sculptural geometry. Some designs layer dress upon dress upon dress. We do not know where one begins and the other ends. Sleeves, pockets and waistbands take on other meaning as they abandon their functionality in the name of silhouette. This is what fashion looks like when it becomes art. The principles of shape, form, color, texture, and composition and balance allow us to move back and forth from recognizing the female body to losing the body all together in a cacophony caused by the protrusions. Kawakubo’s work is as much a sculptural exploration as the exhibition is an installation. 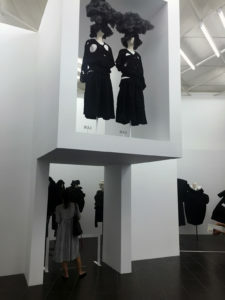 Kawakubo’s practice of padding is not new. Throughout history, women’s bodies were pushed, prodded, cinched and reshaped in the name of fashion. Fifteenth century dame’s side bustle padding could extend over a foot in each direction. Marie Antoinette’s 18th century gowns did the same. The shape balanced by towering wigs and hair pieces, sometimes holding dolls, toy ships and food in their complex tresses. There were aptly named lobster bustles of the late 1800’s, their crustacean-like constructions scaling down the backside of fashionable Victorians. Remember those shoulder pads of the 80’s? Perfect for those who bemoaned their weak clavicular forms. Men too have sported padding, and not only the protruding nether region cod pieces of the 1400’s. There were ballooning pants of the Renaissance, waist cinchers that rival women’s corsets in the late 1800’s, and oversized zoot suits of the 1940’s. It has never been enough to simply exist in our skin. It is our very nature to challenge our own shape, to manipulate and redefine. Kawakubo understands this like no other designer. She is relentlessly exploring shape, and how it might extend from the body, altering fashion into wearable art, and asking us to see ourselves differently. 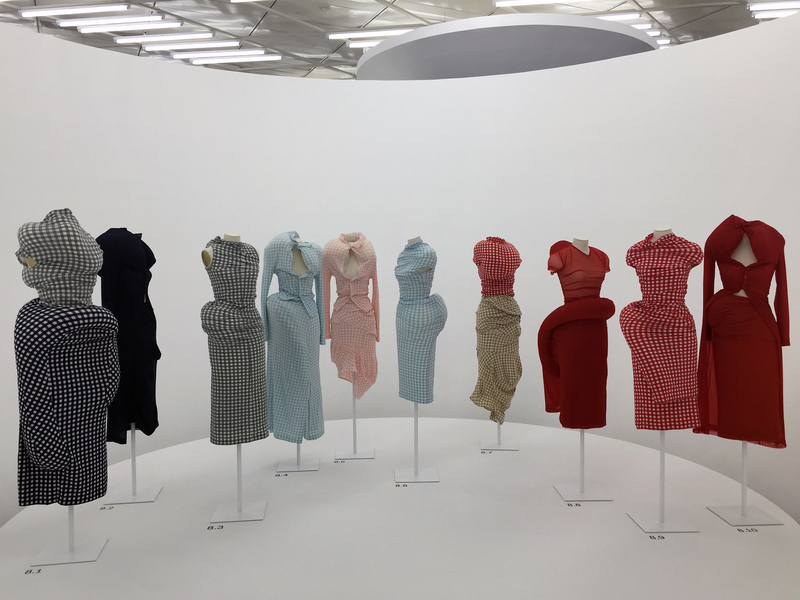 Rei Kawakubo’s work questions the very nature of contemporary gender and femininity. The designs read light and whimsical one moment, dark and sinister the next. Kawakubo’s work is armor for the modern woman. The “Order/Chaos” collection is a perfect example of this. Gorgeous brocades, baby blues and pinks, vermillion and gold, promise the sensuality of a geisha, while the designs themselves harken back to an 11th century Japanese Samurai. There is always a play of light and dark, beautiful and grotesque. This is what is so very alluring about this exhibition. The Metropolitan Museum of Art understands this, and gives us the environmental experience needed to fully appreciate this work, to the point of becoming a part of it. 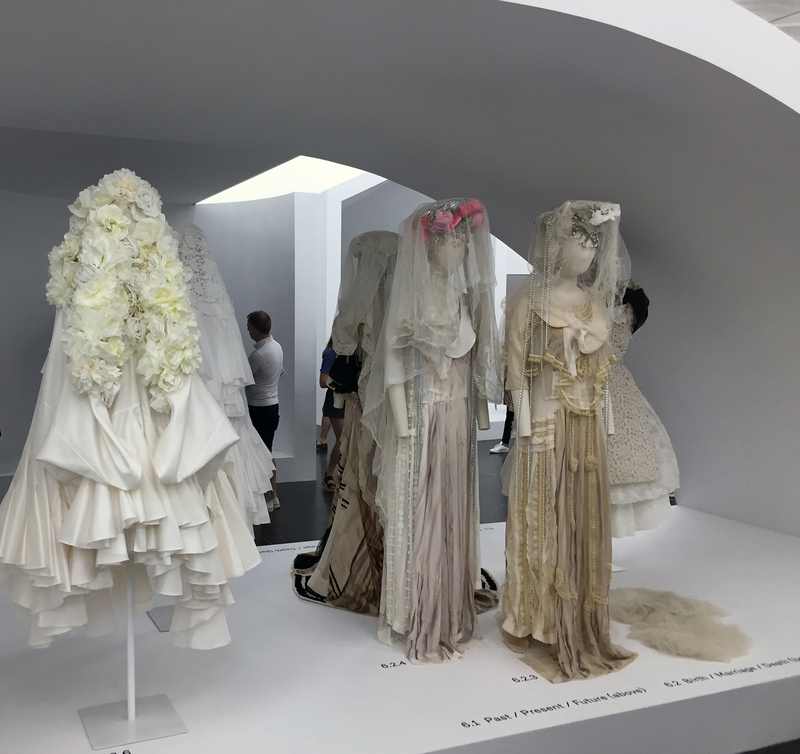 Kawakubo’s work challenges our expectations, exposing our need to protect ourselves at one moment, and sexualize at another. She grasps the capriciousness of the human condition and wields it into shape. In doing so, she presents us with an alternate view of ourselves. She offers us ‘otherness’. It is beyond fashion, for it is a portrait of our nature, at times beautiful, at times ugly. Because of this duality, not in spite of it, her work reads as undeniably human.